That was true 20 years ago when I first started developing telehealth technology designed for the chronically ill elderly. At that time, people in general had no experience with technology, other than a telephone, and therefore were fearful of trying to use a computer, or plug cables into a box, to check their vital signs. That's why the telehealth vendors had to get into the manufacturing business — so they could build devices that were easy to use, and which required no experience with a computer. Fast forward twenty years to today: My-89-year old parents both use an iPhone, an iPad, a Mac computer, and a smart TV. Now, they don’t write code, or use advanced applications, but they certainly know how to write emails, text message, download applications, go shopping online, and watch their favorite TV shows. I believe my parents are two of hundreds of thousands of elderly persons who have become comfortable with using necessary technology. Now, I may still argue that “my patients won’t use that technology” if it's not easy to use, private in nature, and seen to be a benefit to their health. For many people, health is a private matter, and they don't necessarily want to use one of their shared household devices (like a computer) to interact with health information, report vital signs, or have a video-based visit with their nurse or doctor. Some people might also find it difficult to navigate a telehealth solution if it requires cables, extensive set-up, pairing, or downloading an application. And let’s not forget that the patients who could benefit the most from RPM are the least likely to have experience with any technology, and therefore may be more intimidated than people like my parents. Patients may also decline to participate in an RPM program if they are in denial --they've accepted their fate and believe there's nothing that can help them, or they don't have the cognition to interact with health-related information. For all these reasons, I believe it's important for the industry to design a patient experience that's private, secure, easy to use, and which requires no set-up, no pairing of devices and no manual connecting to the internet. At Care Innovations®, our latest success has come with using commercially off-the-shelf devices (like an iPad), but locking them down for privacy and security. In this way, the device's only function is to serve as the RPM connection for the clinical staff helping the patient navigate health challenges. 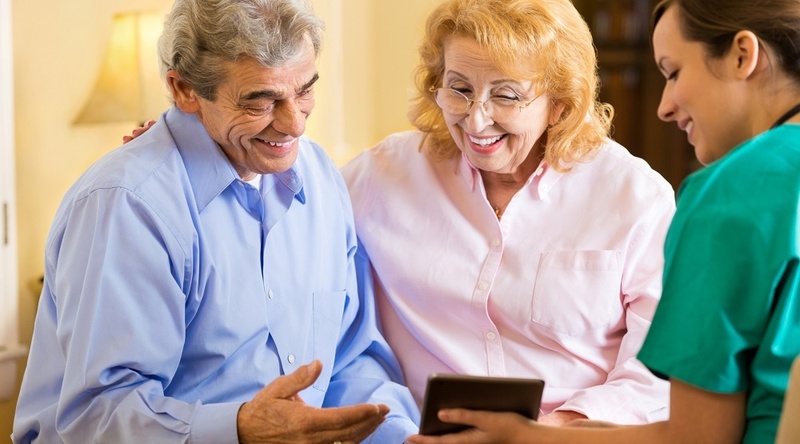 For younger populations, most of whom are are already highly proficient with technology, we're now providing downloadable applications that connect with existing devices that the patient may already own. I don't believe the current elderly population is quite ready for that yet, but they are using dedicated RPM solutions quite successfully. Now, when I hear clinicians say, “my patients won’t use that technology,” I can respond with great success stories of older Medicare populations and larger Medicaid populations all successfully using it! We have patients as old as 90 years who are loving the program. One patient comes to mind who initially declined because she was concerned that it was “technology.” Once we convinced her to try it, we had daily phone calls with her for the first three days, walking her through the process of taking her sessions and using the blood pressure monitor. After three days, she was fully confident, using the system daily, and loving the connection she had with the nurse who was monitoring her status. Now, she says she'll never give it up! So, when you have a patient whom you think will never use that technology — think again! Julie Cheitlin Cherry, RN, MSN, is the Chief Clinical Officer at Care Innovations, with responsibility for the company's overall clinical strategy and engaging clients with consulting services to focus on care model design, population assessment, business model design, and more. Julie is responsible for all clinical aspects of Care Innovations® solutions and services development to ensure clinical and business value, as well as customer satisfaction, for healthcare systems and healthcare providers. Julie brings more than 40 years of nursing and clinical expertise to the role. Before joining Care Innovations, Julie helped pioneer the first home telehealth solution for remote patient monitoring. She has worked diligently throughout her career to influence the adoption of technology-facilitated care models designed to meet the needs of the chronically ill.
Julie is an advanced practice nurse with a specialty in gerontology. She has written several publications and position papers on the impact of technology for remote patient monitoring and chronic illness management. She holds both a B.S. and an M.S. in Nursing from San Jose State University.